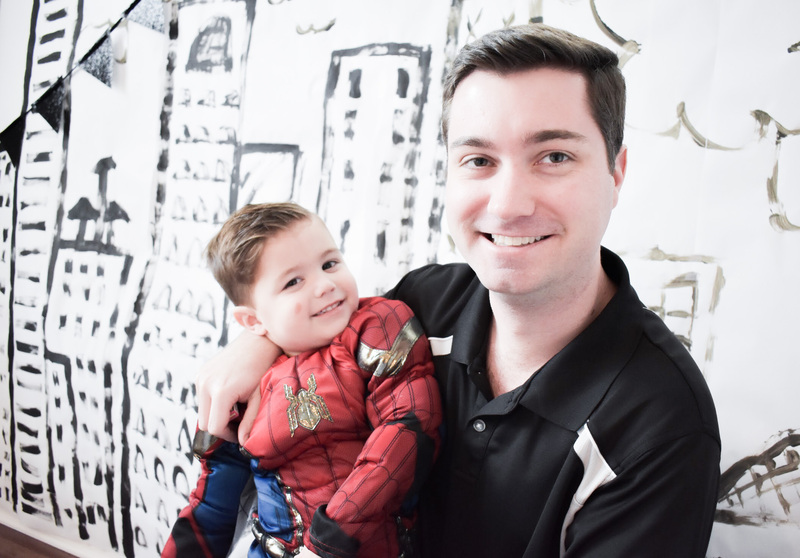 For his third birthday, Colton requested a Spiderman birthday party. I’m not big on character parties, so this theme was a bit of a challenge for me. 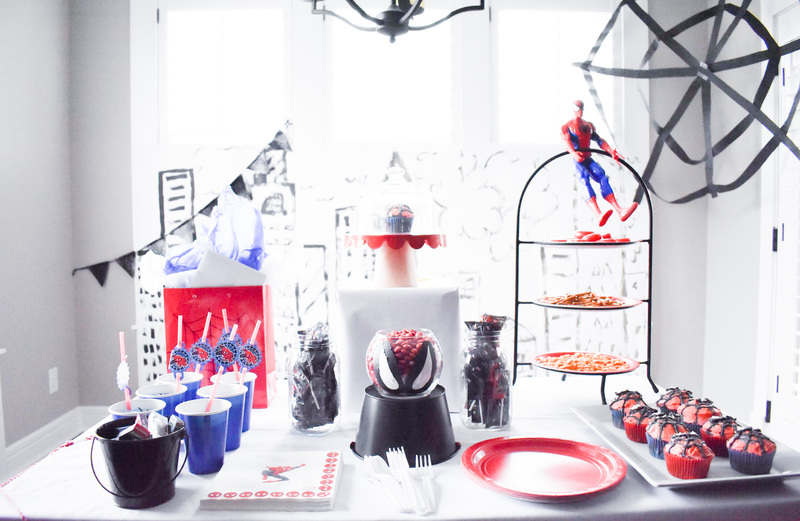 But, I found some amazing Spider-Man party ideas and [I think] succeeded in pulling off a classy Spiderman birthday party [if such a theme exists]. Here’s the setup of our Spiderman birthday party! 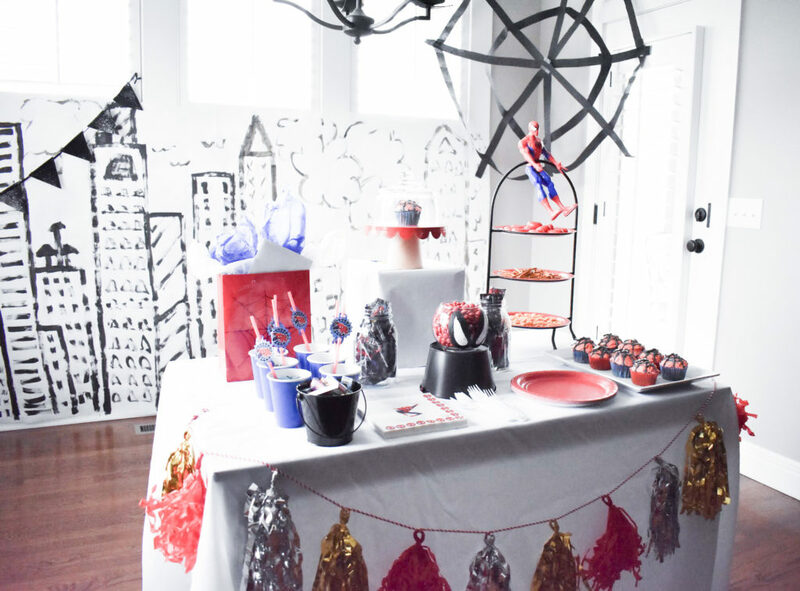 I used Spiderman’s signature colors of blue and red, along with classic black and white. 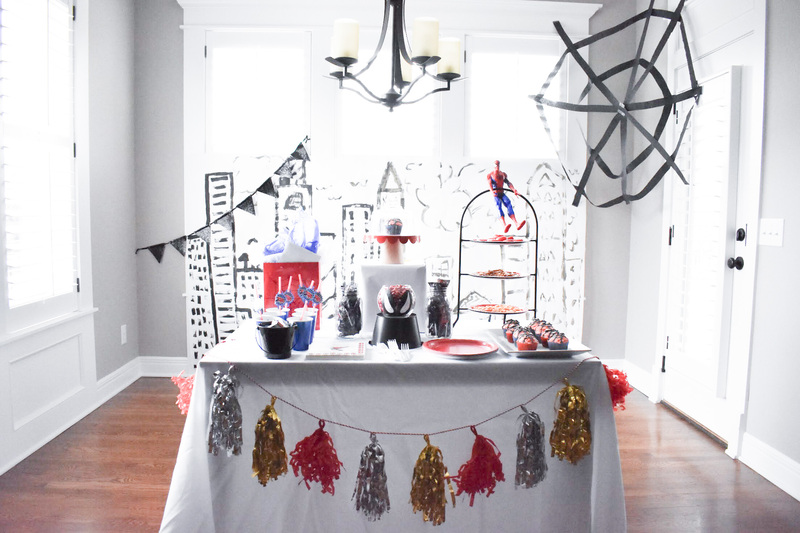 I love using black and white decorations for parties for multiple reasons. 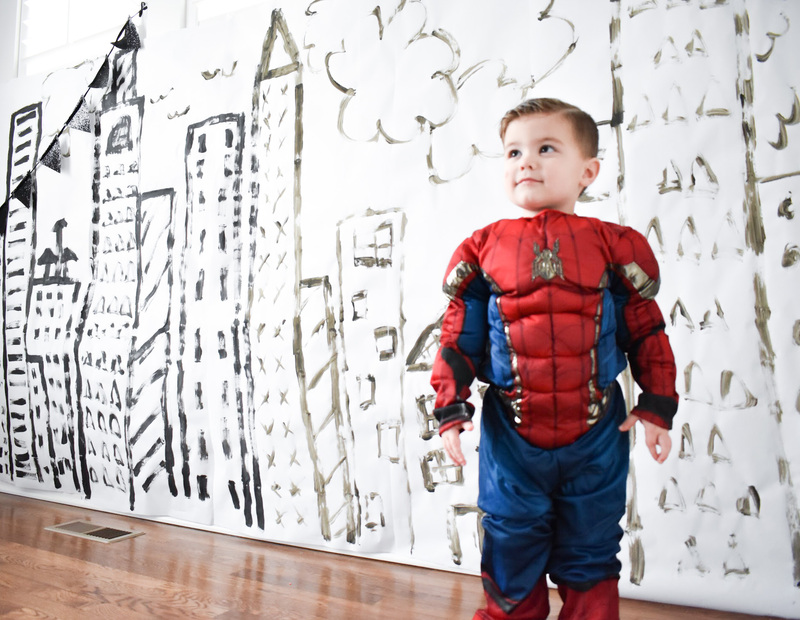 First, they’re versatile–look how many of the items here aren’t specific to Spiderman. I can easily re-use them for other parties in the future. Two, they’re classy–I feel like black and white gives everything a modern look, as opposed to a more flashy character party. 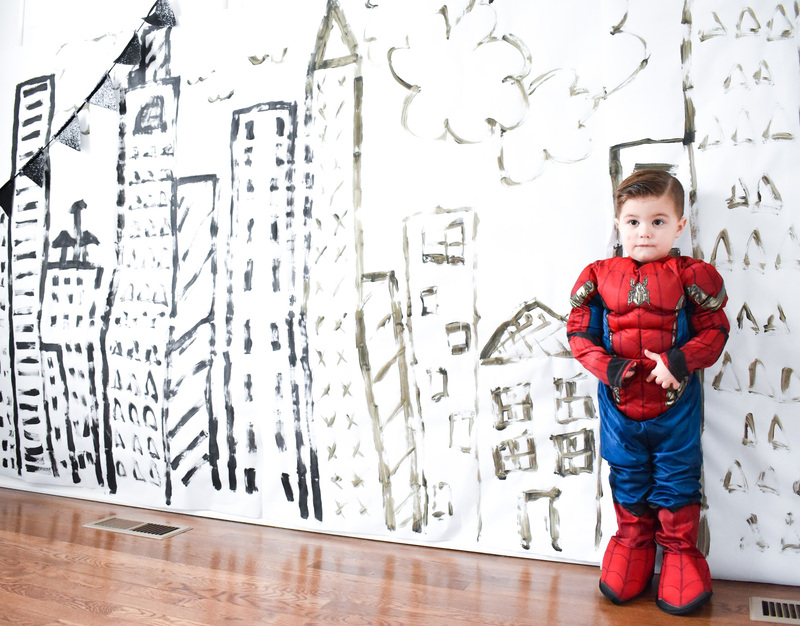 The spider web in the corner is made from crepe paper and tape. I simply stood on a barstool and taped the crepe paper where I wanted it to go. I would’ve liked to go bigger or even across the ceiling, but I only had one roll of crepe paper, so I had to keep it small. 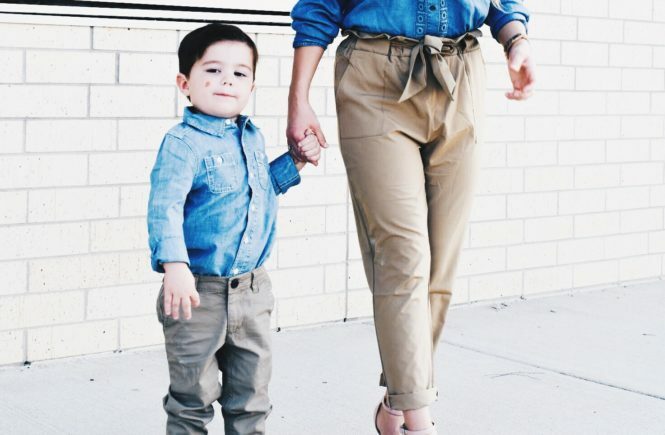 The main star of the show [besides Colton, of course!] was this hand-painted cityscape. 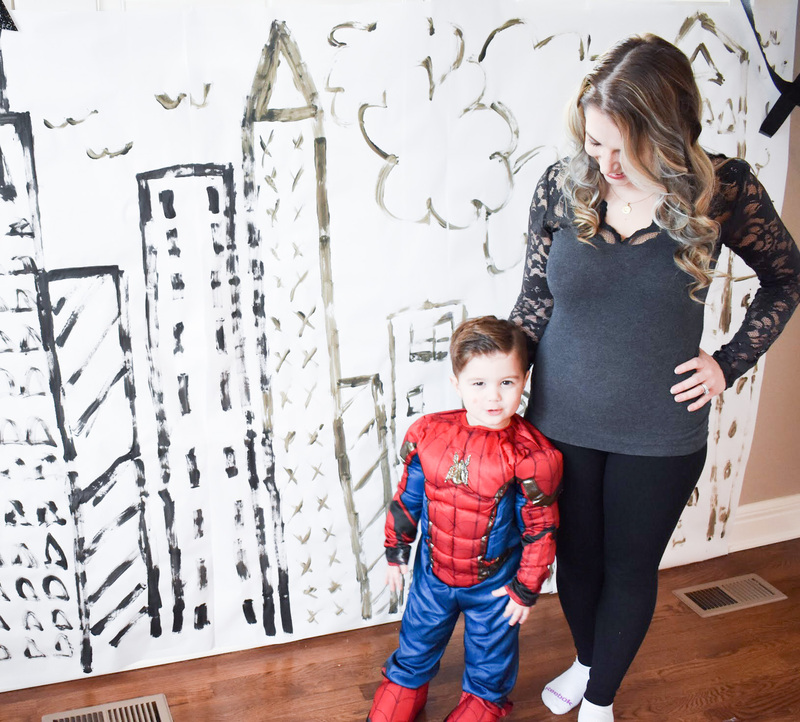 I taped white craft paper to the wall [the kind that comes in big rolls] and used a foam brush to free hand some buildings, windows, etc. 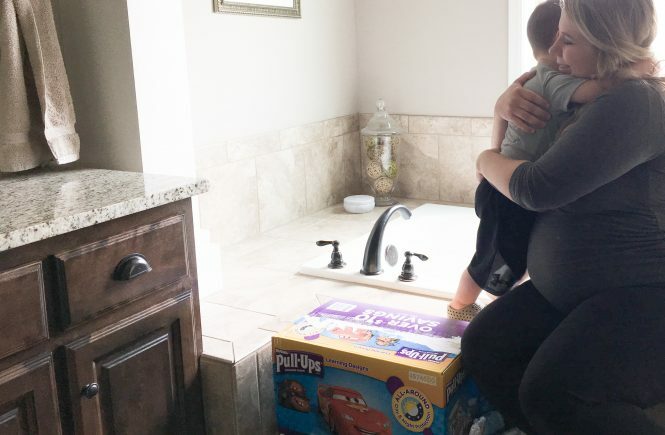 Vary the height of your buildings to keep it interesting, and change up the window designs, too. I used some squares, straight lines, X’s, window panes, etc. 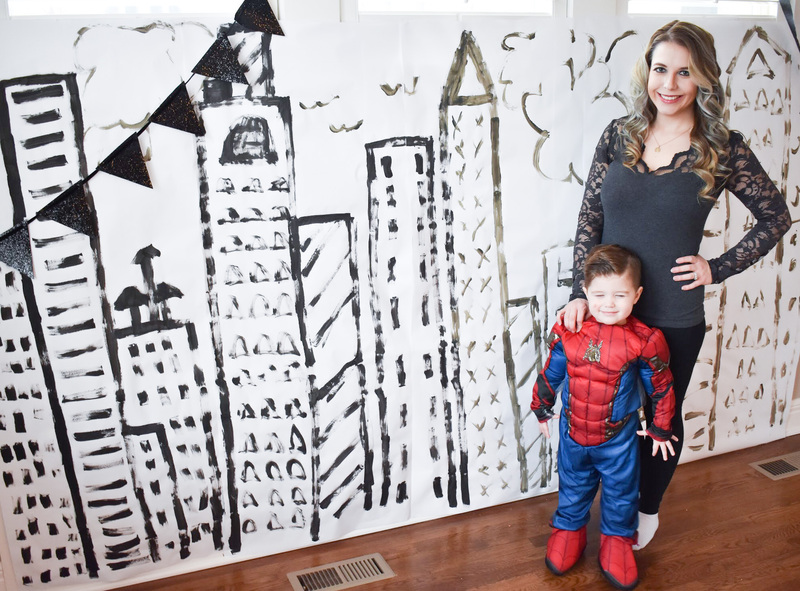 It served as a fun photo backdrop for everyone during the Spiderman birthday party! Here’s a closer look at the table setup. 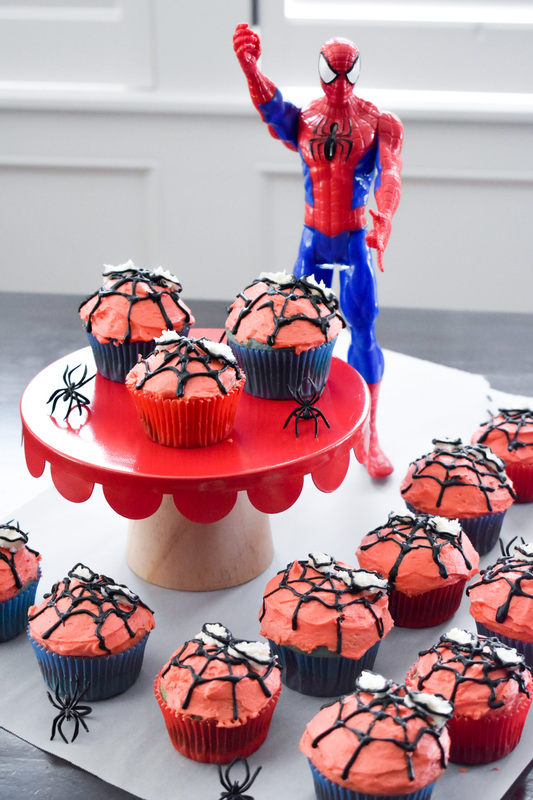 Since the party was in the early afternoon, we kept food to simple snacks and, of course, Spiderman cupcakes. 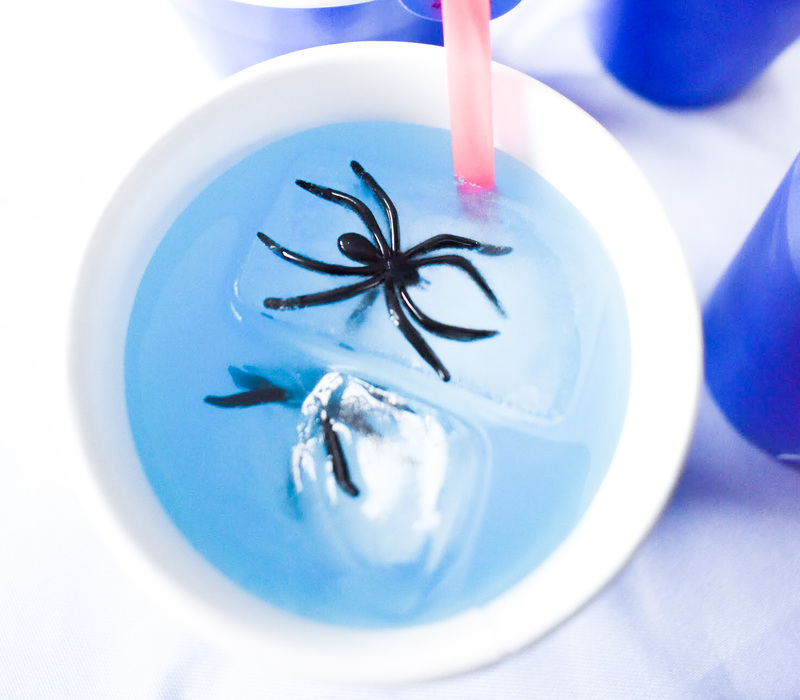 For drinks, we had blue lemonade [Colton loves this kind!] 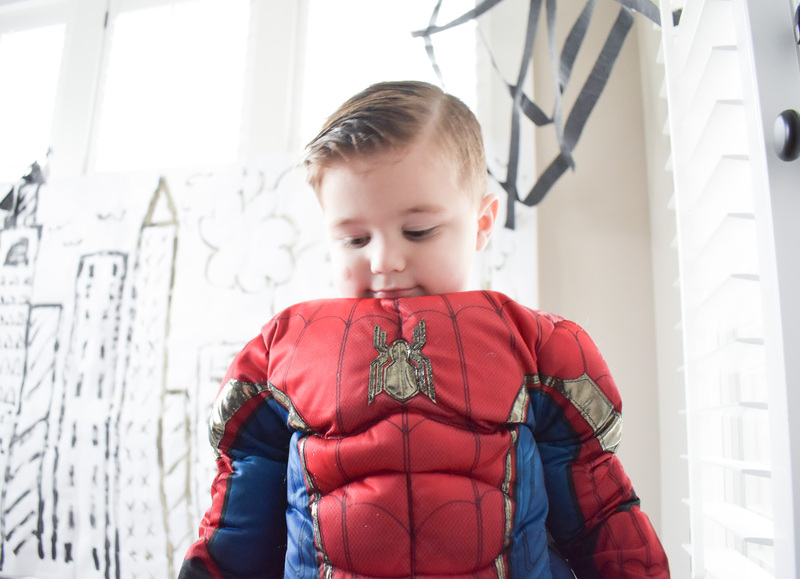 to stick with Spiderman’s color scheme. 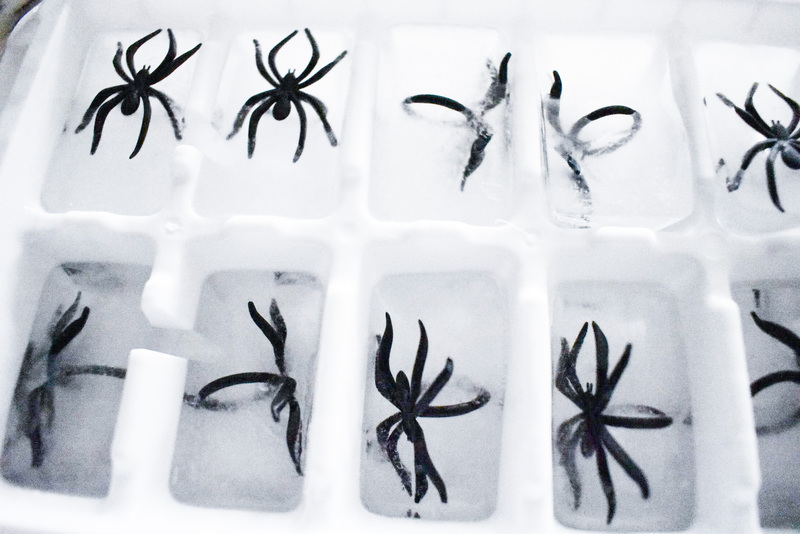 I froze spider rings in ice cube trays to add interest, a cheap and easy DIY that goes a long way in presentation. 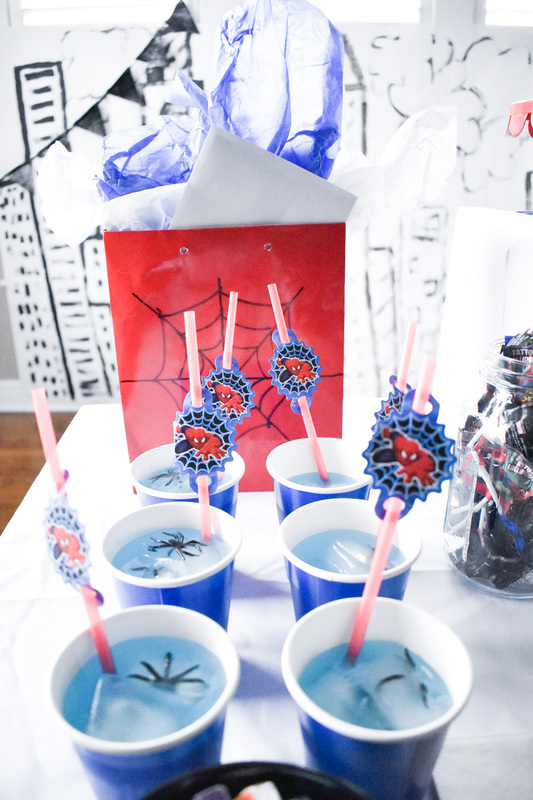 Then, we finished the drinks off with these Spiderman straws. 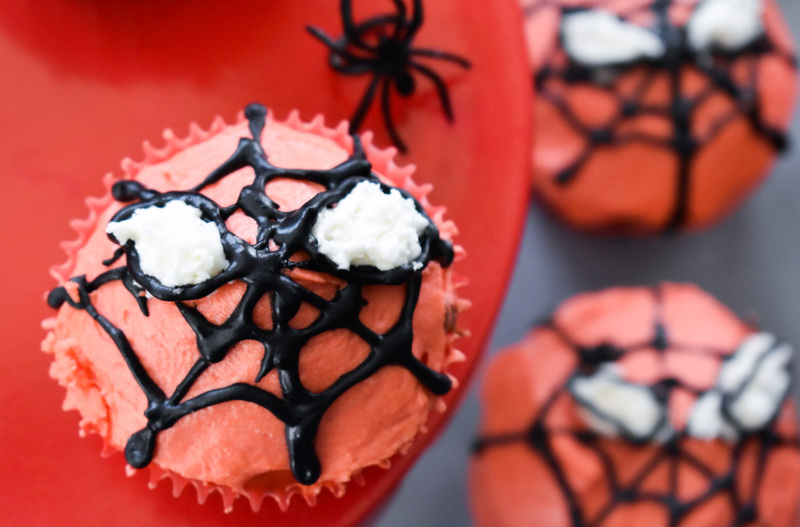 The cupcakes were a labor of love. I’m not much of a chef, but I can usually do alright baking. These turned out even better than I hoped! 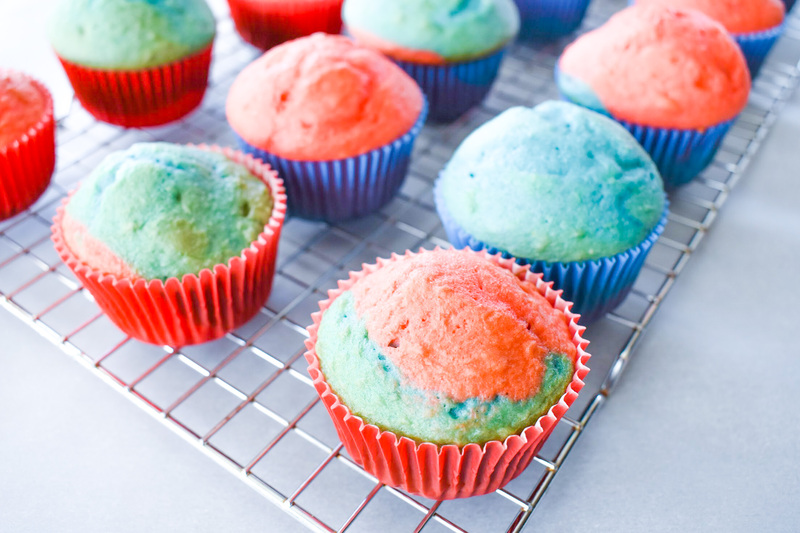 First, I baked tie-dye cupcakes in red and blue cupcake wrappers. 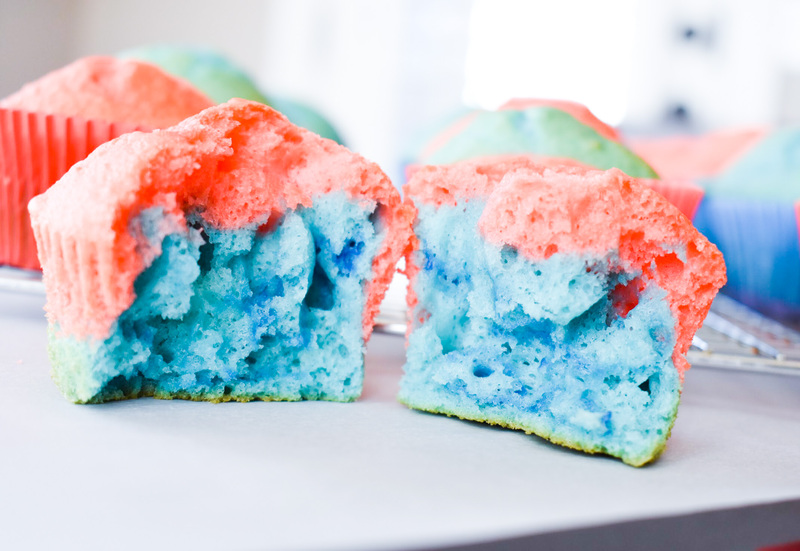 I used this cake mix so I’d have a nice white base to work with, then used red and blue food coloring to create the tie-dye effect. Here’s what they looked like when you bit inside. 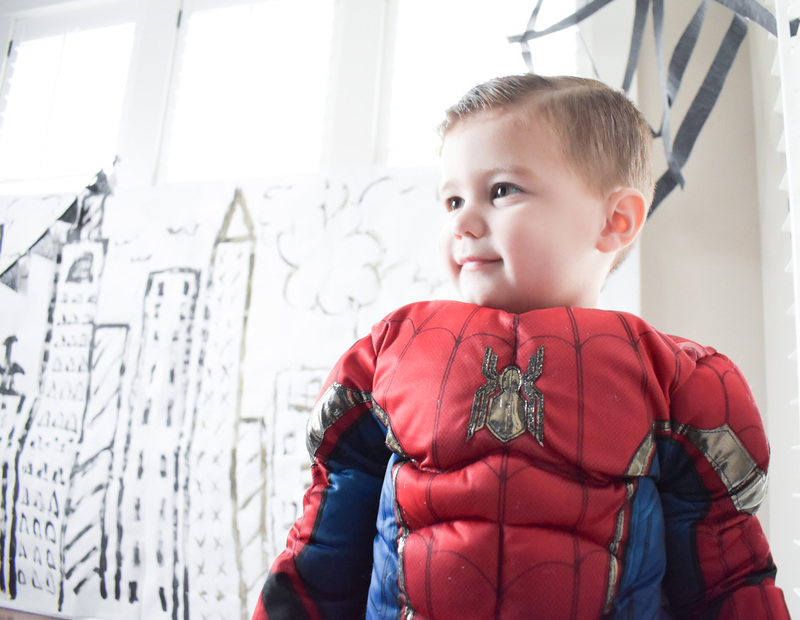 Colton thought it was super cool… to be honest, I kind of did too. 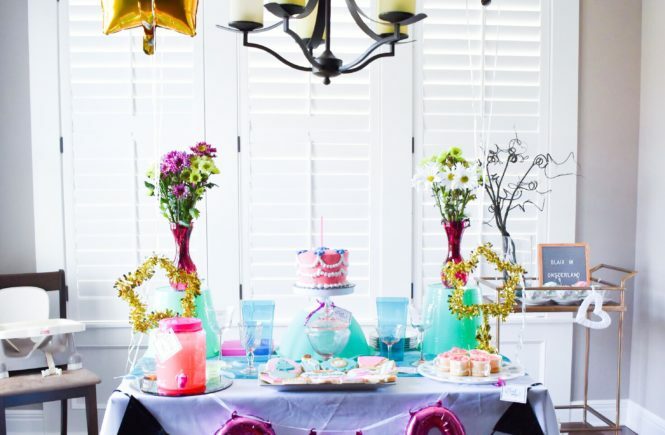 This would be fun for any party, since you could easily change up the colors. And here’s the final fully-decorated product. 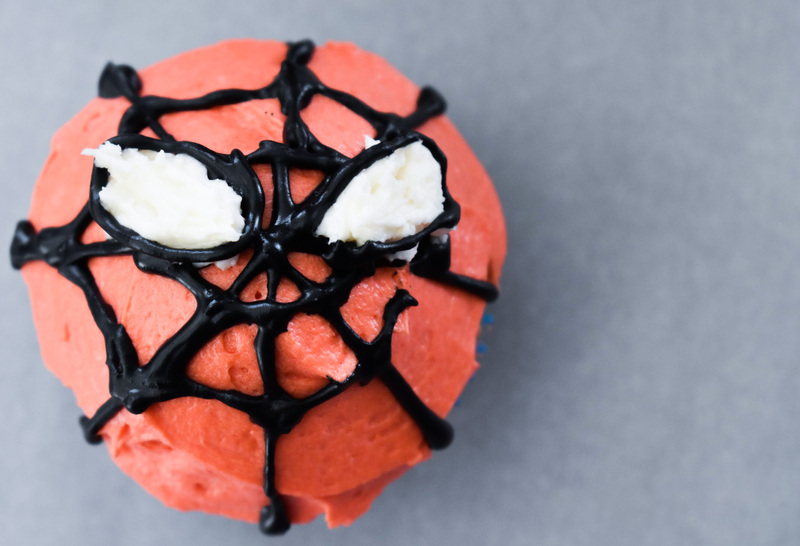 I made my own buttercream icing, colored most of it red using icing colors [saving aside a bit of plain white for the eyes], and designed the spider web using a combination of a fine-tip decorating icing and a toothpick. 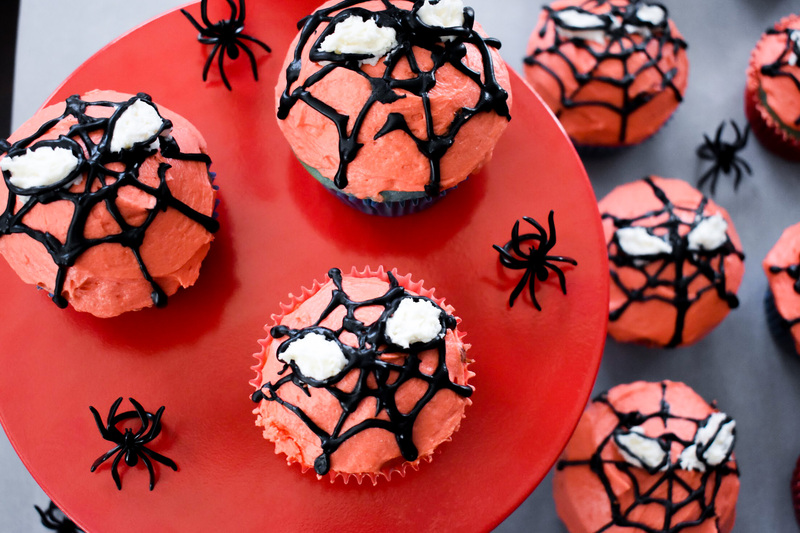 These little spider web cheeses were another fun food idea. 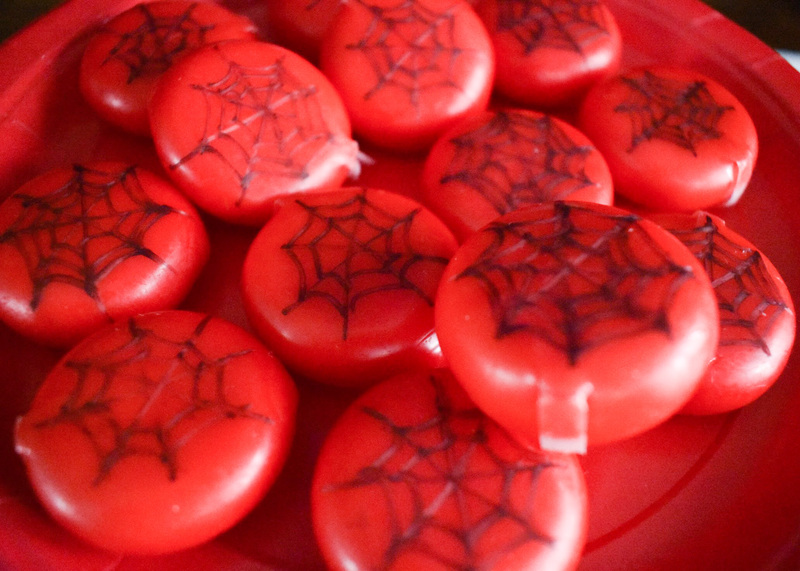 I simply used a Sharpie to mark a spider web design on Babybel cheeses. 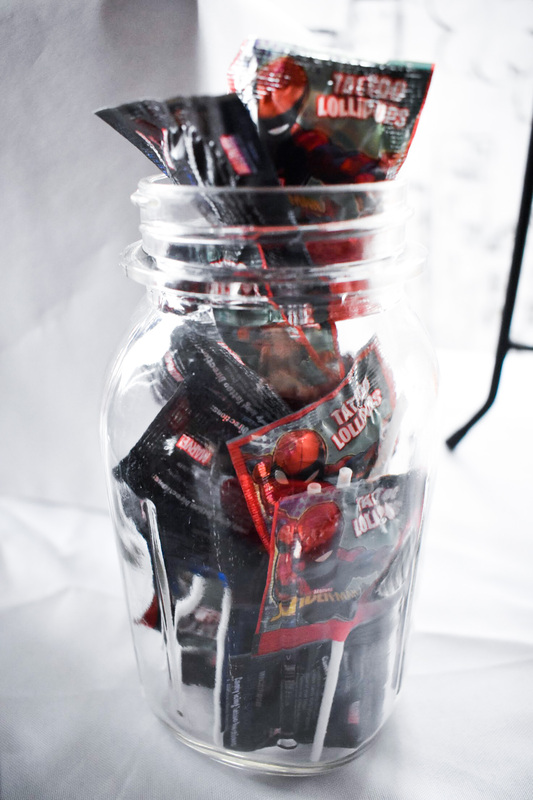 Spiderman lollipops in a mason jar were a fun treat, too. 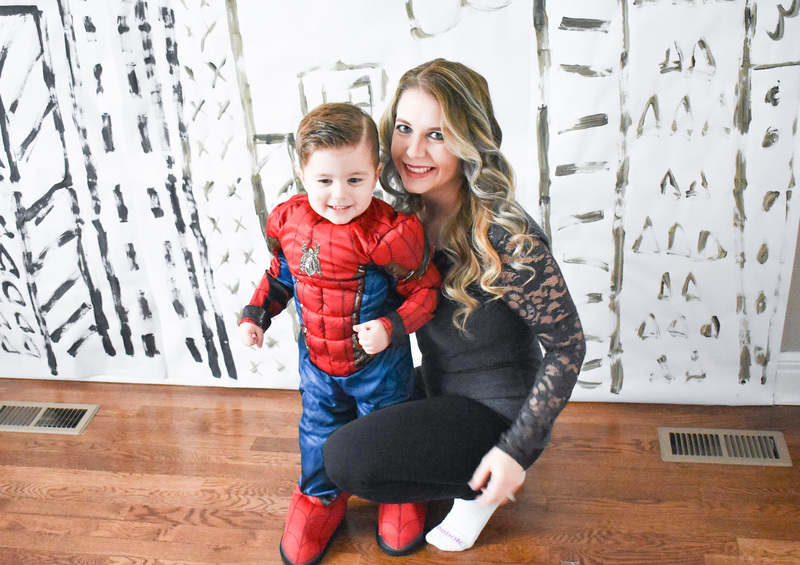 For this craft, I took a glass bowl [this particular one is from Dollar Tree] and used black and white acrylic paint to paint Spiderman’s eyes. 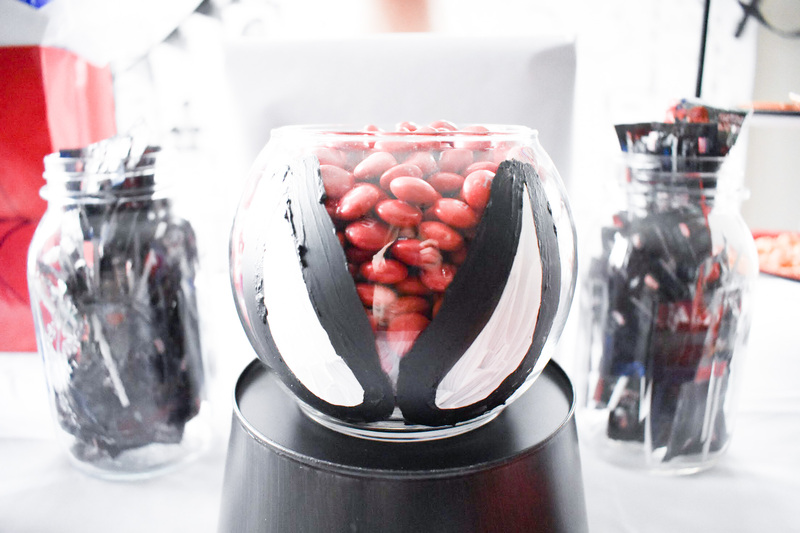 Then, fill with red M&Ms! Here was our birthday boy’s gift display! 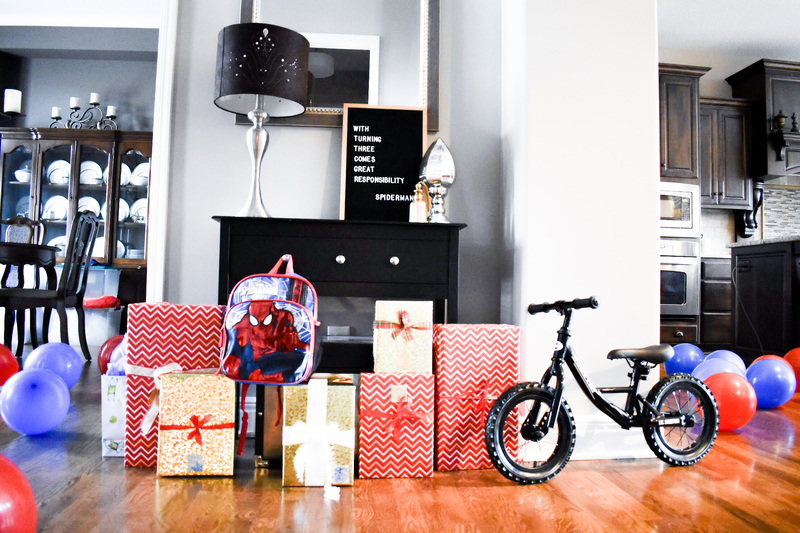 Ignore the totes of holiday decor in the dining room… we try to get all the Christmas decor down before Colton’s birthday, but I’m not always successful. 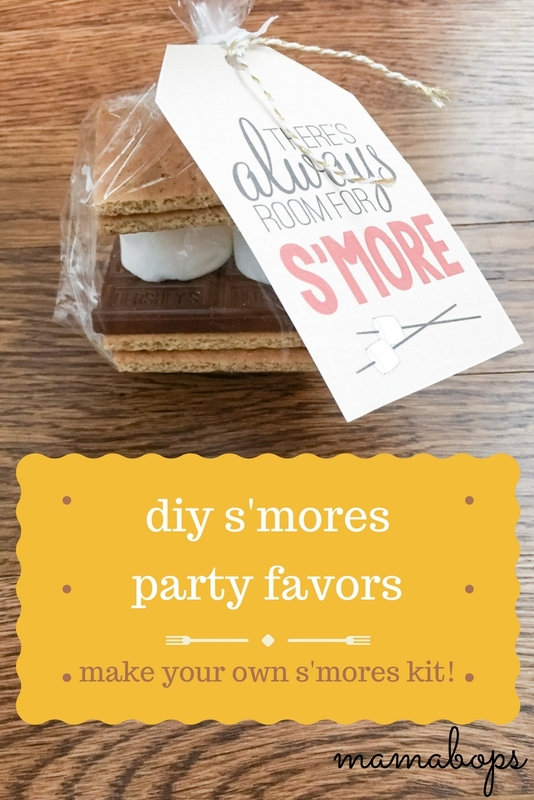 Letterboards are a great investment because you can use them for any party or event. 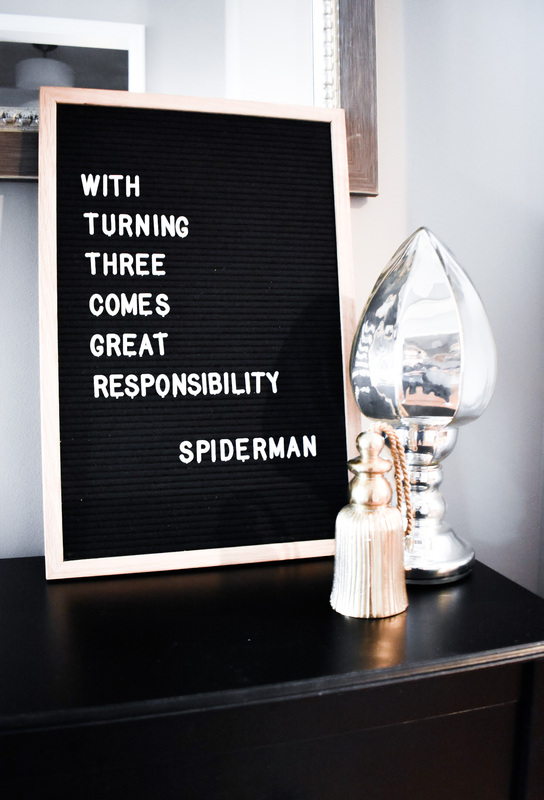 Here’s the letterboard I have, and here it is in use at Blair’s birthday party, too. 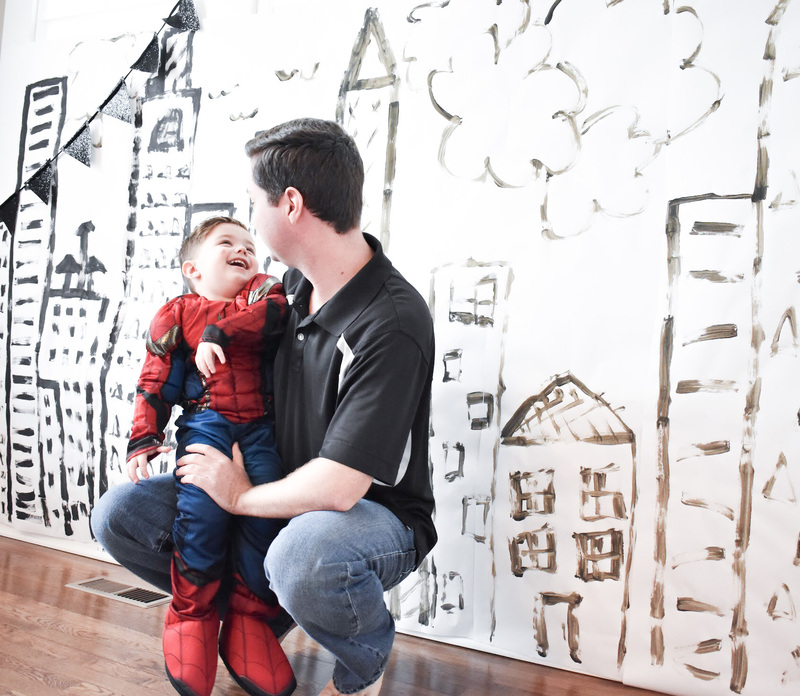 The cityscape provided a fun backdrop for photos. 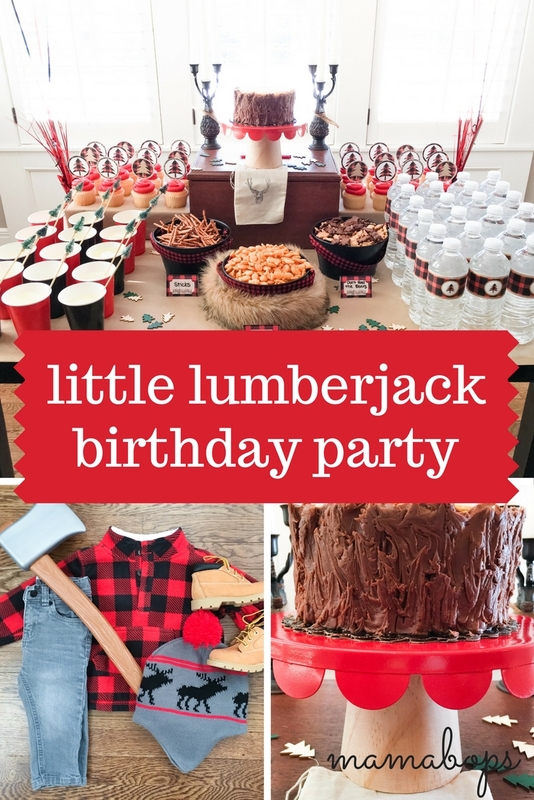 We always try to get commemorative photos of the kids on their big days [here are Colton’s Little Lumberjack photos and Blair’s Alice in ONEderland pics!]. 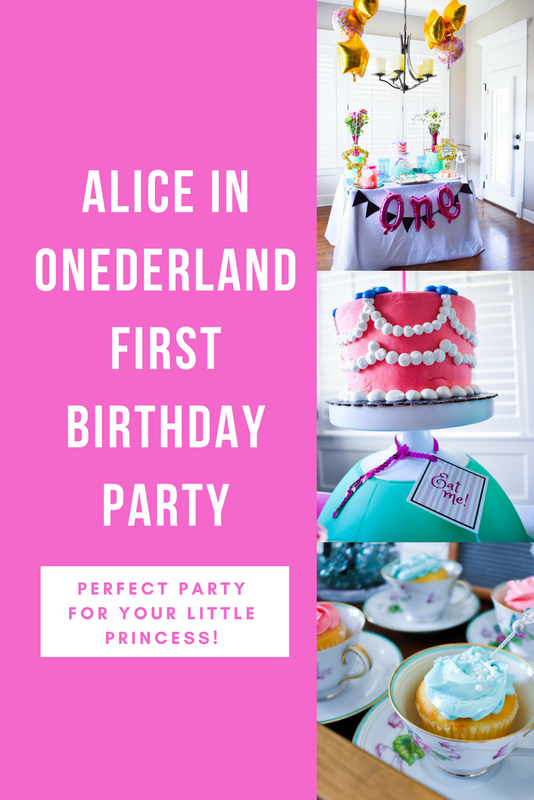 It’s fun to look back on their party themes and outfits, and, of course, how much they grow and change in a year’s time! 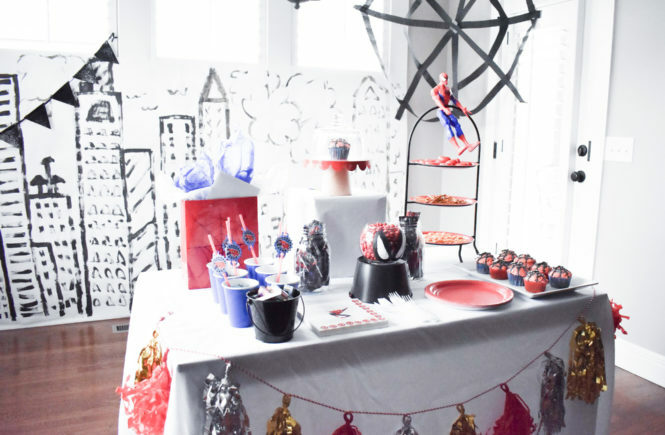 Hope you enjoyed these Spiderman birthday party ideas! If you have any questions about sources or instructions, feel free to leave a comment or e-mail me. 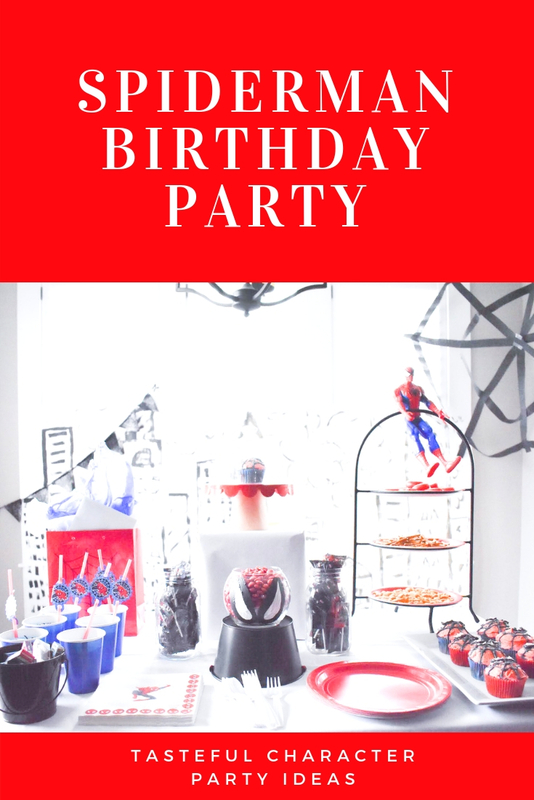 Pin these Spiderman Birthday Party – Spider-Man Party Ideas for later!